If any chemicals are used in your workplace, it is essential that you protect employees and ensure you have a robust chemical burn treatment process in place. Chemical burns can be caused by a variety of substances; from acids and gasolines to something as simple as drain cleaner. It can be difficult to identify a chemical burn, with some only developing hours after contact. Whether there as an immediate, or prolonged, effect the most important step is to get treatment as quickly as possible. 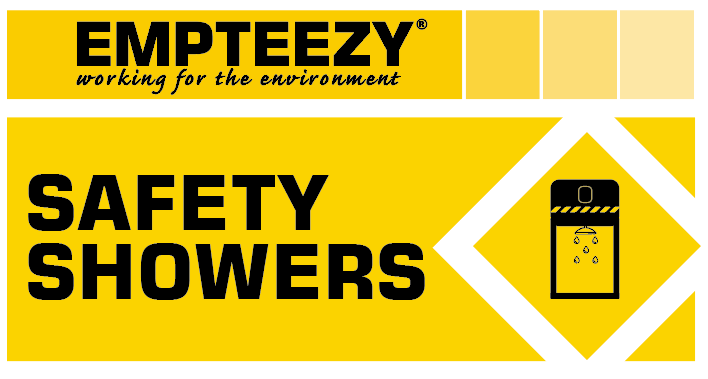 At Empteezy, we have developed a range of decontamination equipment ideal for a variety of working environments. We offer a selection of plumbed in emergency safety showers and eyewash basins, and have recently launched our ANSI standard, self-contained Vertical Tank Shower – ideal for remote working. Despite the environment you work in, there is a general “10 second rule” that means the journey from the site of contamination to the relevant equipment must have an uninterrupted travel time of 10 seconds, bearing in mind the chemical burn injury may increase this time. The most essential step in chemical burn treatment is to remove the substance from the patient as quickly as possible to prevent further injury. Where highly corrosive chemicals are in use, best practise would determine the decontamination equipment be placed as closely as possible to workers. Patients should aim to remove any contaminated clothing or jewellery from their person and immediately rinse the affected area for around 15 minutes, being sure to protect the eyes. Whilst the burns themselves may be of greatest concern, the associated shock a patient may feel can be deadly. Keep an eye out for signs, which include fainting, shallow breathing and paleness. If any of these signs are spotted, patients may need emergency medical assistance. Shock is one reason we believe tepid water is crucial when creating and supplying emergency decontamination equipment. A flushing liquid temperature of below 16 degrees can cause hypothermic shock and prolonged exposure to colder temperatures may affect the ability to maintain an adequate body temperature. Should workers already be in a state of shock, this could have serious consequences. A temperature exceeding 38 degrees can enhance chemical interaction with skin or eyes, only escalating the problem. Following decontamination, the injury should be treated with a loose gauze or bandage to protect from infection. If the burn does not require medical care, workers should take pain relief as required. The chemical burn is more than 3 inches in diameter. The chemical burn severely encircles a limb, or involves the hands, feet, face, eyes, buttocks, groin or major joint. Don’t forget: If medical assistance is needed, you must alert staff to the chemical in question which will allow for adequate treatment. The patient enters a state of shock. Where a tetanus shot may be required. To find out more about our range of emergency safety showers and decontamination equipment, why not get in touch or arrange your free site assessment today? Tepid water is essential in the treatment of chemical burns. Remember the “10 second rule” for patient journey time. Remind workers to remove ALL contaminated clothing and jewellery. Ensure workers protect their eyes when showering. Spot the signs of shock and get medical assistance immediately.